- silicone anti-wrinkle pad for under your eyes. Wrinkles that form under your eyes are some of the hardest to treat. The sensitive skin around and under your eyes is often the first to develop fine lines and wrinkles. The new SilcSkin™ Eye Pads are specially created to eliminate and prevent bags, crow’s feet and to smoothen crepiness caused by wrinkles that form on the sensitive skin under your eyes. As with all of our anti-wrinkle pads, prolonged use will help return skin to a more youthful appearance. Aging, including genetic and hormonal changes, environmental factors like sun, wind and repetitive facial expressions are the primary causes of eye wrinkles. The aging process robs you of precious skin saving abilities which help strengthen the skin. A reduction of collagen content, diminished elasticity, decreased hydration and the thinning of skin all contribute to the phenomenon called “crepiness” or crepe like skin and the forming of wrinkles on skin tissue surrounding and under your eyes. SilcSkin™ is the brand of choice for makeup artists, dermatologists & skincare specialists worldwide. Made of 100% medical grade silicone our pads contain no allergy causing additives or adhesives so that our products can be used on highly sensitive skin. With SilcSkin, there is absolutely no need for additional anti-wrinkle creams, lotions etc. With SilcSkin, there is absolutely no need for additional anti-wrinkle creams, lotions etc. They are also good for any skin type, and contain healing properties that help reduce stretch marks and scarring. The pads are hypoallergenic, soft and comfortable to wear. SilcSkin pads are very easy to use, and can be worn while relaxing, lying down and sleeping. They can also be reused, for up to 30 days. 1. Remove pad from box, cut open poly bag, do not discard. Remove pad from backing. 2. The pad is self-adhesive. The pad will begin to lose adhesive qualities in approximately 30-60 days. Once this happens a new pad should be applied. 3. Apply the pad to the desired area of the face while sleeping, or any time of day for an hour or more. 4. Make sure the face area is thoroughly clean, dry and free of moisturisers, sunscreens,etc. Sweating at night may interfere with adhesion. 5. Remove the pad slowly in the morning in an upwards motion and store stuck to the poly bag. 6. Pads should be washed occasionally to remove exfoliated skin cells that may interfere with the adhesive quality of the pad. 7. Pads should be washed with an antibacterial soap that is free of moisturisers, emollients or oils. Allow pad to air dry in a clean location. Do not dry with a towel. Once dry, return to poly bag. 8. Do not use on sensitive, irritated, cut, scratched or burned skin. Do not use if there is a known sensitivity to silicone. Discontinue use if a rash or irritation occurs. 9. 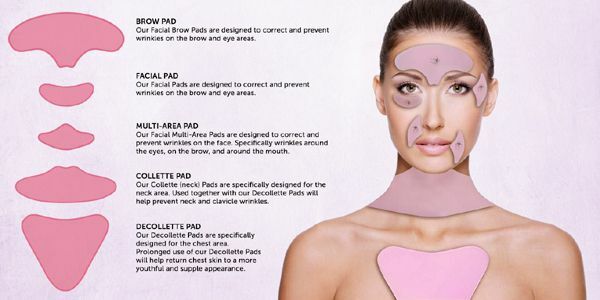 Decollette pads are made of 100% medical grade silicone. There are no allergy causing additives or adhesives used. Pad is not transdermal. These pads are a more “press” to stick adhesive. Should the edges become loose, simply apply pressure, pressing down again to seal the pad to your skin. Have you washed the pads? Regular washing them with an antibacterial soap or baby shampoo will remove the exfoliated skin cells which can interfere with the adhesive quality of the pad. Another trick after washing them is is to dry it with a hair dryer,as it helps to revive the adhesive. One of our customers says she gets months out of her pad doing this! The pads are to be worn on clean dry skin with absolutely no product or lotions underneath, this interferes with the adhesive quality as well as can cause rashes and reactions.Also, night sweats will interfere with the adhesive quality of the pad. Also, if you think the pad might have become contaminated with either a residue of soap, lotions or sunscreens it can be wiped down with rubbing alcohol (using a gauze or paper towel) to clean it. Also, the area where you wear the pad can be cleaned with Witch Hazel and allowed to dry prior to wearing the pad, this assures that no residue of product remains on the skin and also helps if there is perspiration.